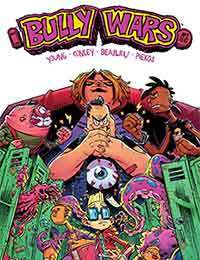 Bully Wars Average 0.00/5 - out of 0 total votes. Rufus, the biggest bully in Rottenville since kindergarten, suddenly goes from bully to bullied on the first day of high school. He's forced to make a shaky pact with his favorite geeks: Spencer and his twin sibling besties, Edith and Ernie. Together they'll have to find a way to survive the Hunger Games-like contest known simply as the BULLY WARS—where the winner will rule the school!